This is a delicious chutney that we often prepare to have with rice. Paruppu thuvayal, Garlic rasam and appalam makes a good combo. 1. In a pan, dry roast the dhal on a medium flame till the dhal turns golden brown. Keep aside. 2. In the same pan, dry roast red chillies. 3. Transfer dhal and red chillies to a mixer jar. Add 1/4 cup of water. Let it stand for 10 minutes. 4. Now, add coconut, garlic and salt. 6. Serve with over the hot rice with a dollop of ghee. lovely delicious thogaiyal Nithu.usually I grind parupu thogaiyal with toor dal.This thogaiyal goes very well with milagu kuzhambu. Looks very delicious, perfect with rice kanji. Love to have it with rasam and rice. looks yummy Nithu! I am gonna try it! New to me.Looks simple & delicious. One of the best comfort foods! Delicious and yummy chutney..thanks for sharing. 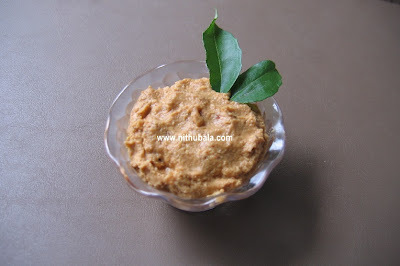 Hi Nithu, I make paruppu thuvayal using toor dal..this is new to me..looks tempting..
yummy :) I love this thuvayal. I make it all the time with puli kuzhambu ..
Paruppu thogayal and rasam rice is my fav. Looks lovely. Very nice Nithu. I love it that you posted this along with chutney.